I have a friend in Florida that I've never actually met. Gary Resnick makes and flies all sorts of stuff. 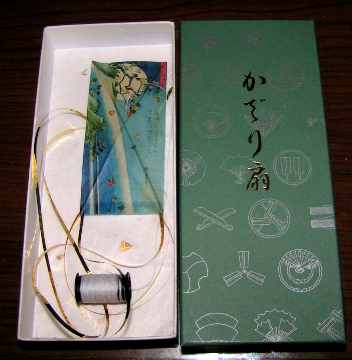 around to it, and traded me a Japanese Koinobori for a small train of my diamond kites. Recently, he sent me this beautiful miniature he made, and I want to share it with you. 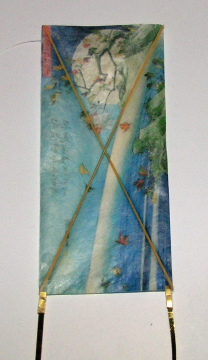 It has a delicate tissue sail, and finely split bamboo spars. 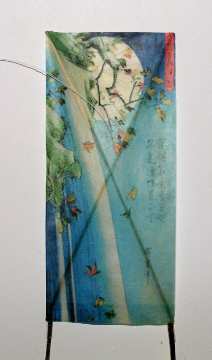 Some of the work on this is far beyond my skills, and reminds me of the Charlie Sotich kites I have, and have seen. Again, I wanted to share it with you. Gary's kite flies great indoors, for a single bridle point! I'm going to try to get him to adopt a two point bridle for it, and maybe some spar mods. Gary's kite website is here.